"God does not play dice": The mathematical-probabilistic model of quantum mechanics and the microscopic physical phenomenon. In the experiment of double slit the states of the particles coming from the two slits are and remain in state of overlapping up to the time when something does not disturb this situation. The wave function is a model of this phenomenon based on probability but the phenomenon that the model is meant to represent can not be probabilistic. Chances are abstract objects, a mental construction, that can never interact with the physical world. If physical objects and abstract objects could interact with, then you should have, for example, a number that can interact with a solid body causing a collision. The particles instead are objects of the physical world and interacting with other physical objects such as the screen, generating stains, and between them, generating interference. When you run the experiment "a particle at a time" can't be that the wave of probability direct the particles because an abstract object, as the probability wave is, can't interact with the particles physical objects. it is inconceivable to continue those interpretations that are between the magical and metaphysical "consciousness cause of the collapse" or the "human eye" effect or other similar assumptions. Consciousness can cause the collapse of abstract objects indeterminacy, as probabilities are, but it can't interact with physical objects. The only thing that can change the path of the particles up to build the interference pattern, must be a physical object, identifiable because it has to interact with other physical objects. I believe Quantum Mechanics has, from its beginnings, made the mistake of confusing the indeterminacy of abstract objects as the probabilities are with the alleged uncertainty of the particles that are physical objects. Schrödinger's cat experiment is, in my view, a demonstration of the confusion that has taken place, in the quantum world, between the abstract logical problems related to isolated systems and the alleged metaphysical behavior of quantum objects. When the behavior of a particle in the "double slit" regime deviates from the behavior "single slit" this can only be caused by a "physical object" able to interact with other physical objects. That this "physical object" could be a field, a space-time distortion, or any other physical object but remains the fact that the requirement of being a physical object is final. The Schrödinger equation does not explain what generates the particle's behavior and as it does not just explain what happens. Each physical particle isn't a "possible" particle but is a physical one, to make his "trajectory" deviates from that expected one there must be a physical object as well, there must be something like a force and energy and more but nothing that comes from the mind or from the pen of the observer. A philosopher might ask you to define 'object' without the recourse to 'an observer'. Given that the status of 'particle' in physics is subject to uncertainty I suggest this is a pertinent question. 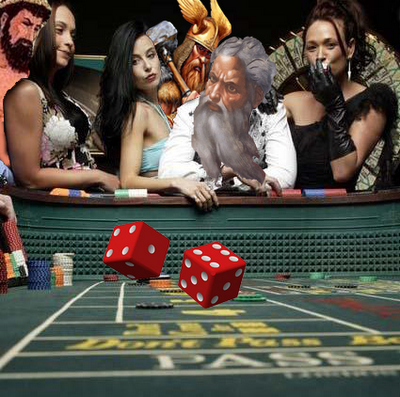 Note too that 'God does not play dice' presumes an anthropomorphic 'God's Eye View'. With reference to 'the observer' question, this tends to generate a circular argument regarding what constitutes a satisfactory explanation for what humans call 'physical events'. Hawkin is a fraud. PR icon for the sheeple. God does throw dice - God does everything that is done - God posts on a2k, eats turnips and looks at you, each time you look in a mirror. Hawking could only say that factually if he knew what game God is playing. Since he doesn't believe in God or the game, anything he says on the topic is sheer 'God bashing' and not science. Since he doesn't believe in God or the game, anything he says on the topic is sheer 'God bashing' and not science. Sheer nonsense. Hawking was using 'God' metaphorically. Been hearing his God metaphors for years. There is a real irony. The Theory of Quantum Mechanics is a core part of miniaturization of digital circuits. You are using it right now. The CPU that is in your computers was developed by engineers who not only believe in Quantum Mechanics, they understand it and they used it as a key part of the technology. Yes, metaphorically speaking... if God did not play dice with the Universe (meaning that Quantum mechanics is not a valid theory), then you would not be able to read this message. Without the weirdness in Quantum Mechanics that Einstein was complaining about, to make a computer as powerful as the one you are reading this on, you would need circuits the size of a building.... and the semiconductor switches that run the internet wouldn't be possible. It is a great irony. People who don't understand Quantum Mechanics using computers that run on Quantum Mechanics on an Internet that runs with switches based on Quantum Mechanics to say that Quantum Mechanics is bogus. (Just to clarify, I am not talking about Quantum computing (an interesting possible future technology). I am talking about the semiconductors your CPU is made out of today. The transistor was made possible by the development of solid state physics, and the subsequent miniaturization trend that has happened since is all Quantum Mechanics). In fact all of semiconductor technology would be impossible - and it's everywhere. Yes, metaphorically speaking... if God did not play dice with the Universe (meaning that Quantum mechanics is not a valid theory), then you would not be able to read this message. I understand that you are speaking metaphorically but it sounds like you are saying that to be valid, quantum mechanics 'needs' to be beyond prediction. Couldn't that be because we just don't understand the underlying logic of it yet? As someone once said - Anyone with sufficiently advanced technology will appear to be magic to those who lack it. 1. Quite the contrary. Quantum mechanics is very good at making accurate predictions. That is why it is useful to make semiconductor circuits (including the ones in the CPU you are using right now). That is also the reason that we accept it as an important part of our modern understanding of science. Science is based on experiment. You develop a theory and then you test it by using it to make predictions and confirming your predictions by experiment. Quantum Mechanics keeps making the right predictions (in spite of the fact the results seem impossible to believe). The point is that right now the more we learn, and the better we are able to use QM to make predictions, and advance science and develop new technology, the stranger it gets. By strange, I mean that it contradicts the way human beings instinctively feel things should work. 3. That is as true as always. I think Some of it was stumbled on quite by accident. Understanding the underlying QM came later. You don't need to speculate... the history is well known. The Bell Labs team that developed the semiconductor transistor was based on the work John Bardeen in Quantum Mechanics. Quantum mechanics was always at the core of their work. There was no accident. They set about to use new discoveries about Quantum Mechanics to develop technology. And that is what they did. True about the transistor. But the first semiconductors were 'cats' whisker' crystal diodes (about 50 years earlier) and I don't think the discovers knew anything about QM. Much earlier than that. Seebeck was the first to notice an effect due to semiconductors, in 1821, using junctions of dissimilar metals. In 1833 Faraday noted effects with silver sulfide, and many more discoveries were made during the 19th cenury. The point is that we are using using devices that are part of the modern semiconductor revolution. And Quantum Mechanics has always been at the center of modern semiconductors starting at least with the Bell Lab team that developed the transistor. But Quantum Mechanics is at the core of modern semiconductors. They were developed using Quantum Mechanics and they work with Quantum mechanics. That is the irony in this thread.